Remove a division titlist's best player from the roster and you've got a team with a problem. Remove the top three players and you likely have a team that fails to qualify for the Stanley Cup Playoffs. That's what happened to the Buffalo Sabres last season when the top two centers, Chris Drury and Daniel Briere, left via free agency and top defenseman Teppo Numminen was diagnosed with a heart ailment at the opening of training camp. That was quite a blow to a team that had won the Presidents' Trophy for best regular-season record the previous season. Despite the loss of offensive sparkplugs Drury, Briere and Numminen (who had 29 and 40 points the previous two seasons), the Sabres finished fourth in the NHL by scoring 255 goals. But only eight NHL teams surrendered more than Buffalo's 242 goals. To that end, Sabres General Manager Darcy Regier acquired veteran defenseman Craig Rivet and a draft pick from the San Jose Sharks in return for two draft picks. He also signed veteran goalie Patrick Lalime to back up starter Ryan Miller. The Sabres got off to a rocky start, as was expected, going 19-19-3 in the first half of the season. They finished the season 6-3-1 and were the Northeast Division's second-best team in the second half at 20-12-9 –- their 49 points were topped only by Montreal's 56 second-half points. The Sabres have a young corps of forwards. Only Jochen Hecht, 31, is older than 30. Drew Stafford and Patrick Kaleta are 22. Daniel Paille and Thomas Vanek are 24. Derek Roy and Jason Pominville are 25. Paul Gaustad is 26. Tim Connolly is 27. Maxim Afinogenov and Andrew Peters are 28. Ales Kotalik and Adam Mair are 29. These players are young enough, skilled enough and sufficiently experienced to contest for the Northeast title. Regier didn't panic last year when he lost Drury and Briere, and he didn't make wholesale changes this summer. Gone are defenseman Dmitri Kalinin, forward Steve Bernier and goalie Jocelyn Thibault. Rivet will be the team's most expensive defenseman and ties for third-most expensive player, but he is durable and productive. Few teams, on paper, have a better backup goalie than Lalime. Goaltending is clearly one of the Sabres' strengths. Ryan Miller is a talented workhorse whose 76 appearances, 4,474 minutes played and 1,907 saves all ranked third in the NHL last season. Only Florida's Tomas Vokoun saw more shots than Miller's 2,104 shots. This will be Miller's fourth full NHL season. He played parts of the 2002-03 and 2003-04 season. He has a 112-68-1-19 record with a career 2.69 goals-against average and a .908 save percentage. Miller led Buffalo to the Northeast Division crown in 2007 and got his team to the Eastern Conference Finals in 2006 and 2007. Buffalo took Miller in the fifth round with the 138th pick of the 1999 draft while he was still playing American junior hockey. He went on to one of the greatest college careers of all time. Miller won the Hobey Baker Award in 2001, the second of three straight seasons in which he was named the CCHA's best goaltender. He was CCHA Player of the Year in 2001 and 2002. Miller played three seasons with Rochester of the AHL and was named the AHL's top goaltender in 2005. Free-agent Patrick Lalime replaces Joceyln Thibault as Miller's backup. The Sabres are hoping Lalime's 16-12-3 record with a developing Chicago Blackhawks team last season is an indicator that he is back on track. Lalime was one of the NHL's top goaltenders earlier in the decade with the Ottawa Senators. 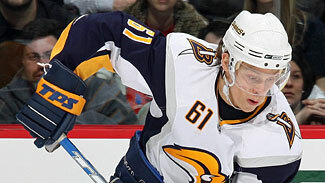 He was traded to the St. Louis Blues in June 2004, but suffered a knee injury there. Chicago signed him but he needed back surgery at the start of the 2006-07 season. Going into last season, Numminen was the big dog on defense, as he had been the previous two seasons since signing as a free agent. The Sabres were rocked when he needed open-heart surgery. Numminen returned for the last game of the season and then signed a contract in early August. Numminen won't be handed a job on Buffalo's top defensive pairing. He'll have to earn it. He's 40, and the Sabres are wise to look for younger leadership while availing themselves of his great skills and on-ice confidence. Numminen's skill set, however, mirrors that of Rivet, the Sabres' top offseason addition. Rivet, also a right-handed shot, plays a good all-around game and has extensive power-play experience. He's noted more for his puck-moving skills than his banging, but he's tough enough. Rivet had five goals and 30 assists and was plus-3 for San Jose last season. The Sabres post a depth chart on their web site that lists Henrik Tallinder, on the left side, and Toni Lydman as their top pairing. Jaroslav Spacek will play the left side on the second pairing and will play on the power play. Lydman is also expected to see power-play time. Rivet is listed as the right defenseman on the second pairing. Andrej Sekera, on the left side, and Nathan Paetsch are listed as the third pairing with rookie Mike Weber penciled in as the seventh defenseman. Mike Funk is likely next in line in the event of injury or disappointing play by one of the top seven defenders. Spacek led the Sabres' defense with 22:58 of ice time, 95 shots, 9 goals and 32 points. His seven power-play goals led the defense and were third behind Vanek and Kotalik. Lydman was the "enforcer" on the defense, dishing out 159 hits and spending a defense-high 74 minutes in the penalty box. Lydman also led the defense with 146 blocked shots and 18 takeaways. Weber has played 16 NHL games. He'll add a little meanness to the defense. He had 181 penalty minutes two years ago with Windsor in the OHL. Sekera looked good in 37 games last season, going plus-5 while posting two goals and six assists. First-line center Roy led the Sabres with 81 points off 32 goals and 49 assists. Roy, the MVP of the 2003 Memorial Cup, has had four steadily improving seasons and will likely center Vanek on the left wing and either captain Pominville or Stafford on the right side. Vanek is far and away the Sabres' most expensive player after Buffalo was forced last year to match an offer from Edmonton. Vanek was the Sabres' third-leading scorer with a team-high 36 goals and 64 points. That was a seven-goal, 20-point decline from the previous year. He also dropped from a league-leading plus-47 to minus-5. Getting Vanek back on track will be one of the Sabres' top priorities. Pominville, like Roy, made his fourth NHL season his best. He had 27 goals and 80 points while going plus-16. Critics say he should shoot more and his fine 13.8 shooting percentage indicates they may be right. Stafford might be the better fit on a line with Roy and Vanek because of his rugged 6-foot-2, 213-pound body. He pays a price for his physical game. Stafford had shoulder and ankle injuries last season, plus a concussion. He has 29 goals and 36 assists for 65 points in 105 NHL games during two seasons. Hecht is likely to center the second line with Paille on his left wing. Hecht is an excellent skater and passer who averages nearly 20 goals and 50 points a season but has a tendency toward late-season injuries. He has superb defensive instincts, and has been in the plus category in all eight NHL seasons. Paille played his first full NHL season last year and had 19 goals and 35 points while going plus-9. He has had only one season in the negative category going back to his rookie year in juniors. Like Hecht, Connolly can play center or winger, but is the better offensive threat. Connolly struggled with hip and abdominal injuries last year after missing the previous season due to a concussion. He struggled with knee problems the year before that. He has great quickness and tricky moves. Center/left winger Gaustad is the opposite of Connolly, limited offensive production but durable, although he missed most of the second half two years ago with an ankle injury. Gaustad has great size and wears down opposing players. Kotalik has slipped from his 62-point season three years ago. He is a streaky scorer who has never had a plus season in five years with Buffalo. Afinogenov has been with the team the longest, since 1999. He started last season with lingering problems from a broken wrist and missed the last 26 games with a groin injury. Mair's season was compromised by an ankle injury in November. He is a tough forechecker and hard checker. Free agent Mathieu Darche may have been signed to fill Mair's role. Peters is a big hitter but his offensive contributions are limited. Forwards Kaleta and Clarke MacArthur have split recent seasons between the AHL and Buffalo and will bid again for jobs, but they are threatened by improving forwards Marek Zagrapan, Mark Mancari, Marc-Andre Gragnani and Tim Kennedy.